For this look, I started with three coats of Zoya Gloria, which is a stunning medium pink full of multi-colored, multi-sized glitter. It has an amazing glittery foil finish, with larger gold chunks that really stand out among the rose and magenta glitter. It is really a beauty! I am totally in awe of pretty much the entire collection. This one almost got away with two coats but I really thought the third coat was necessary to eliminate all visible nail line. Application was smooth and dry time quick. 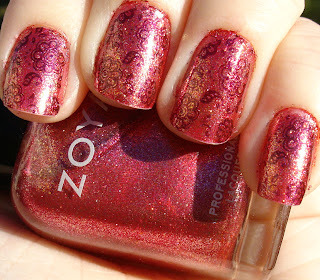 That is 3/3 amazing polishes I have tried from Zoya! 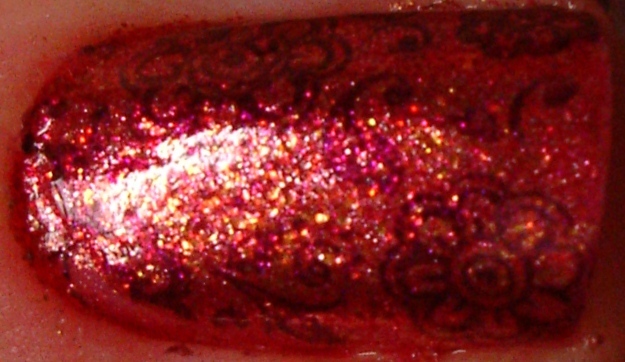 Artificial light - check out the glitter sparkle! I really debated over whether to Konad on this one or leave it as is. 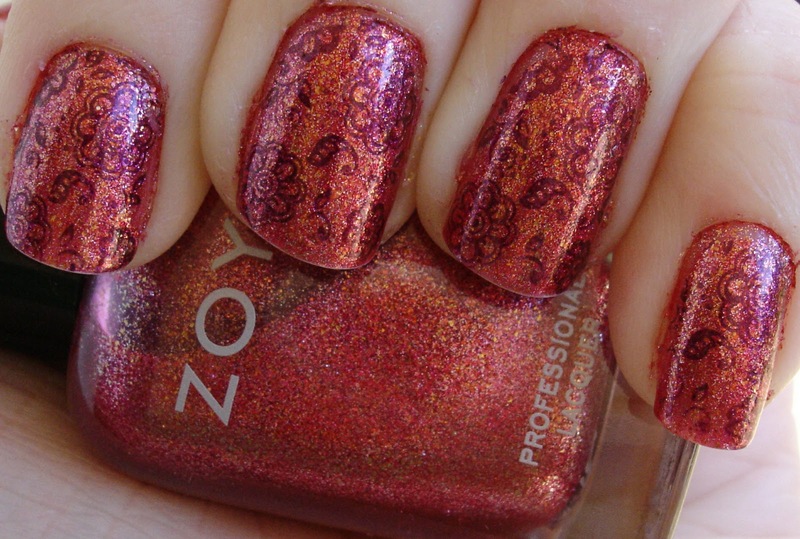 As I was thinking about it, another polish from my order caught my eye... and I realized I just had to give it a try! I used Zoya Valerie and Konad plate m64 to add the purple flowers. Valerie is a totally beautiful color and I can not wait to try her on the full nail! I topped it all off with a coat of Seche Vite and wore it for three days with minimal tip wear and only the tiniest little chip at the end, so wear was pretty good in my book. This was one of those more subtle looks, that from far the design was barely noticeable (if at all) but up close it really popped. I loved wearing it! Glad I caught this post before going to class. That's some excellent wear for three days! I'm happy you stamped your nails too, they look fantastic! This is so pretty! I'm new to nail stuff and I think this Konad thing is awesome.